Real-life IoT implementations involves millions of devices having different hardware platforms and wireless connectivity protocols deployed at hundreds of locations. At that scale, treating each device individually is close to impossible. Gateway platforms work as the core building blocks to make your IoT devices securely connected to cloud services as easy as possible, so you can focus on adding real value to your IoT application. Gateways play a key role in all facets of IoT solution – from device connectivity management, security, interoperability, scalability, edge computing to cloud integration. Indeed, selecting the right Gateway is critical to your long-term success. 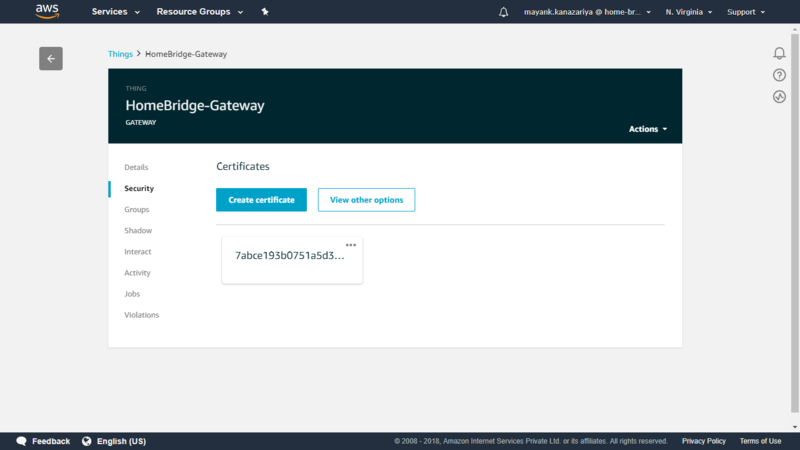 In this article, we’ll show you how easily you can connect and control Zigbee or BLE sensors or devices using AWS IoT Platform, HomeBridge® Gateway, and Connected Mobile Application. 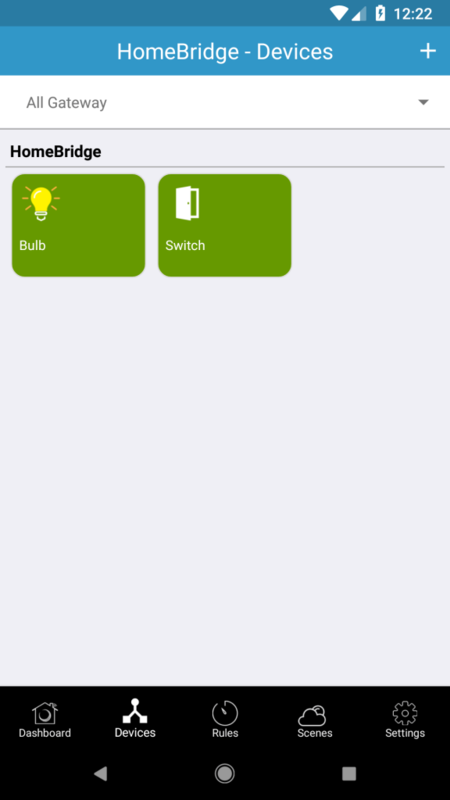 In this case, we’ll walk you through, how to configure AWS IoT Core to connect and control a Zigbee light bulb using HomeBridge®. The same demo is applicable for other Zigbee or BLE devices. Why Enterprise leverage AWS IoT Core Services to build great IoT solutions? 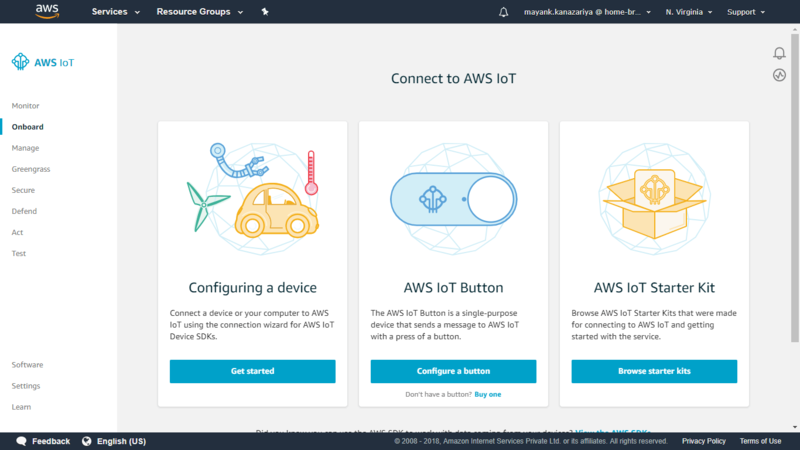 AWS IoT Device SDK enables your devices to connect, authenticate, and exchange messages with AWS IoT Core using the MQTT, HTTP, or WebSockets protocols. AWS Device Gateway Service maintains long-lived, bidirectional connections, enabling these devices to send and receive messages at any time with low latency. Message Broker Service supports messaging patterns ranging from one-to-one command and control messaging, to one-to-one million (or more!) broadcast notification systems and everything in between. 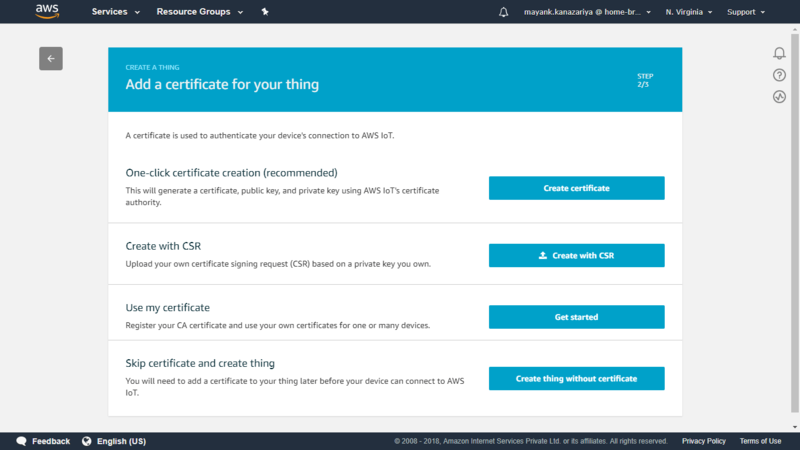 Authentication and Authorization service supports the AWS method of authentication (called ‘SigV4’), X.509 certificate-based authentication, and customer created token-based authentication (through custom authorizers). 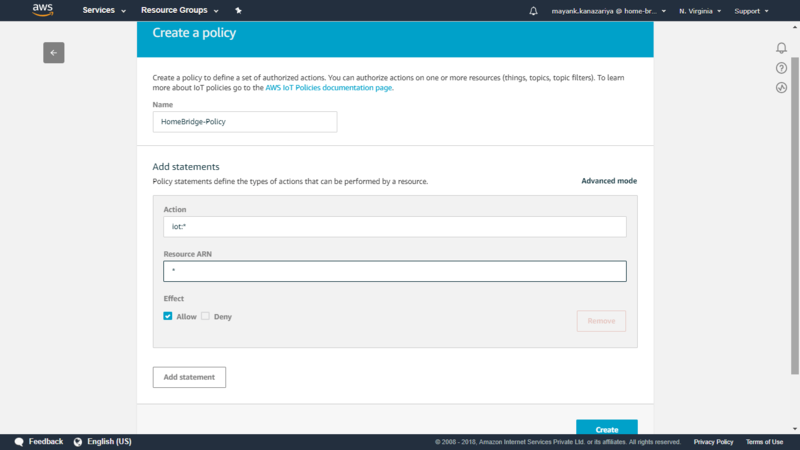 You can create, deploy and manage certificates and policies for the devices from the console or using the API. 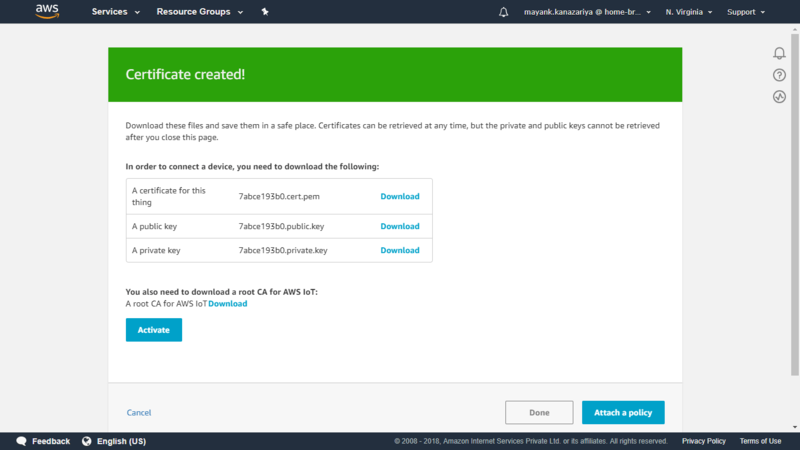 Those device certificates can be provisioned, activated and associated with the relevant IoT policies that are configured using AWS IoT Core. This allows you to instantly revoke access for an individual device if you choose to do so. 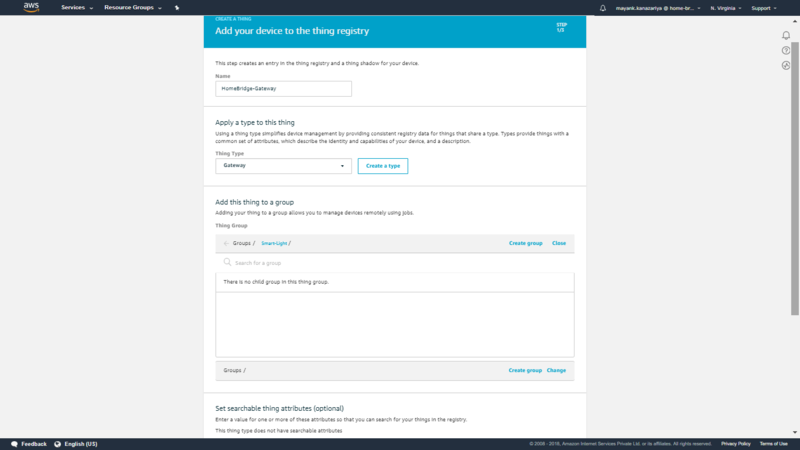 Registry service establishes a unique identity for devices and tracks metadata such as the devices’ attributes and capabilities. Device Shadow service persists the last reported state and desired a future state of each device even when the device is offline. You can retrieve the last reported state of a device or set a desired future state through the API or using the rules engine. It makes it easier to build applications that interact with your devices by providing always available REST APIs. Rules Engine Service makes it possible to build IoT applications that gather, process, analyze and act on data generated by connected devices at a global scale without having to manage any infrastructure. It routes messages to AWS endpoints including AWS Lambda, Amazon Kinesis, Amazon S3, Amazon Machine Learning, Amazon DynamoDB, Amazon CloudWatch, Amazon Simple Notification Service (SNS), Amazon Simple Queue Service (SQS), AWS IoT Analytics, Amazon Elasticsearch Service with built-in Kibana integration, and AWS Step Functions. External endpoints can be reached using AWS Lambda, Amazon Kinesis, Amazon SNS, and AWS Step Functions. Before we get started with the demo, here is a quick overview of HomeBridge® Gateway Platform. Improves response time: Eliminate dependency on intermittent networks, reduce the cost of running IoT applications for all requests and offer seamless user experience. 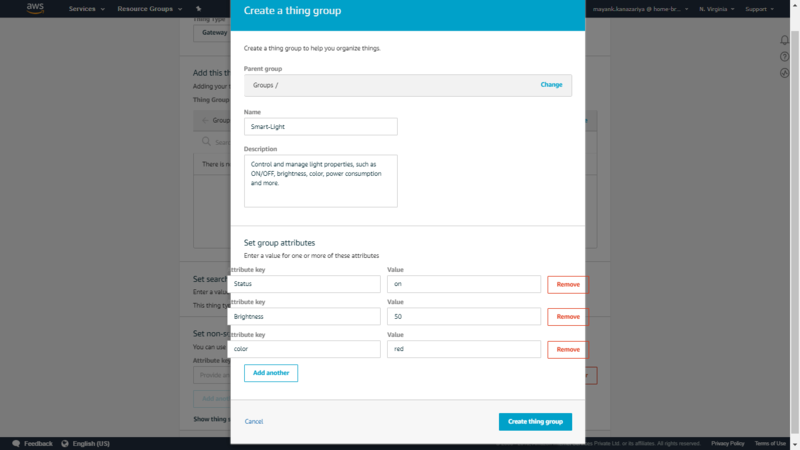 Rules Engine and Scene Management: Customizable rules engine for use case based real-time alerts, automation, scheduled control options for connected devices. Here is a sample solution architecture to understand how HomeBridge® gateway and AWS IoT core accelerate time to implement any IoT Solution use case. All these components can run in a single AWS IoT account. 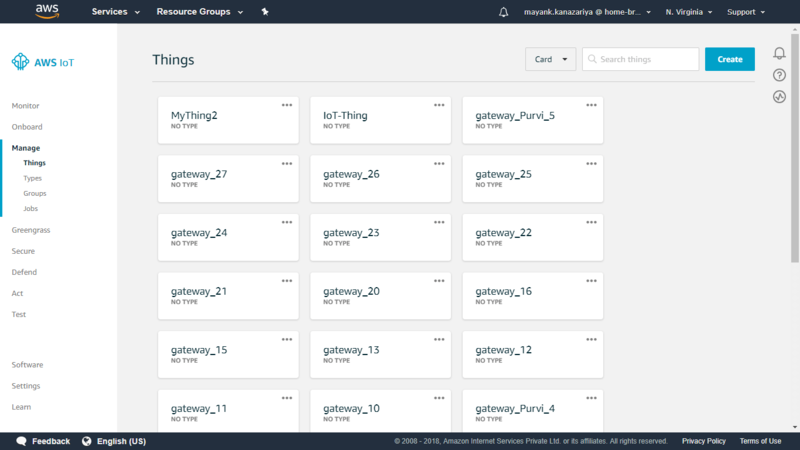 However, it is more common to see the HomeBridge® to AWS IoT Integration tier running in end user’s AWS account and the AWS IoT and end-user application components running in a Customer/OEM’s AWS account. If you are looking forward to building your own IoT solution leveraging your choice IoT devices, please Contact us to implement your custom IoT use case. To demonstrate, how easily you can integrate HomeBridge® with AWS IoT Core, we’ve built a small demo project using a Zigbee light device, HomeBridge® Gateway kit and AWS IoT account. IoT device having Wi-Fi, Zigbee or BLE interface can communicate directly with AWS IoT but for that, you need to install AWS IoT SDK on devices. 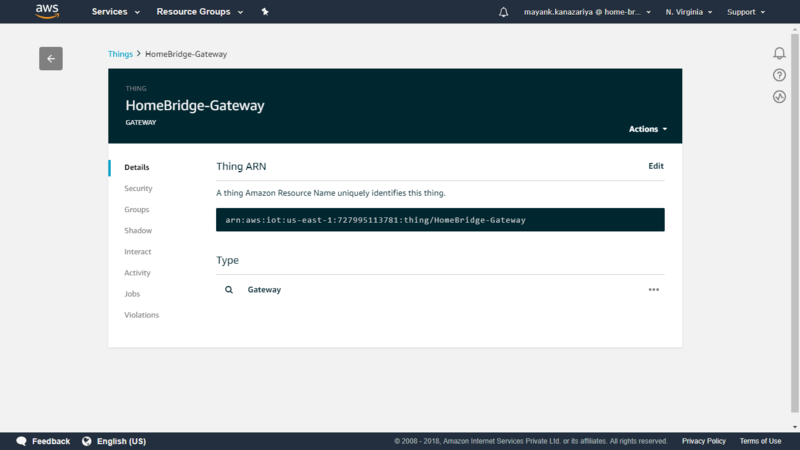 In this case, HomeBridge® gateway manages secure connectivity between device and AWS IoT; thus, devices, therefore, do not need to have the AWS IoT SDK installed. 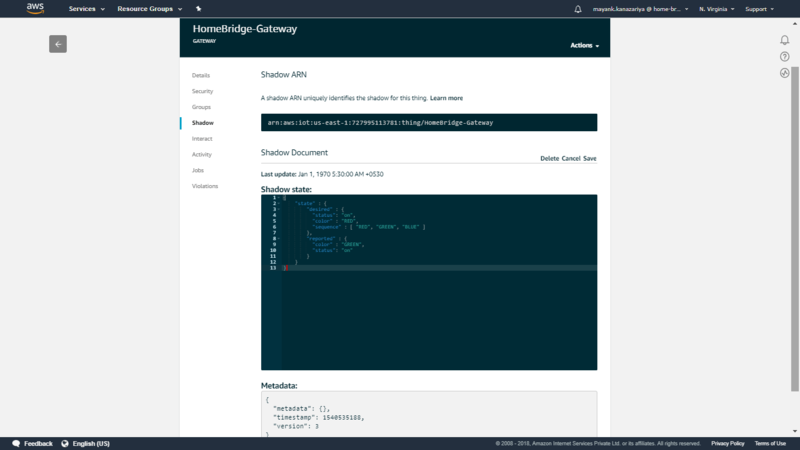 Request for HomeBridge® Gateway with pre-embedded AWS IoT device SDK to enable device data flowing securely from devices to HomeBridge® to AWS IoT Core. Follow the extensive HomeBridge® getting started guide and videos on how to commission and connect the device into HomeBridge®. We’ve set up this demo using the same documentation. If you need any further information or to update the firmware and configure the development environment for the gateway, kindly contact us. 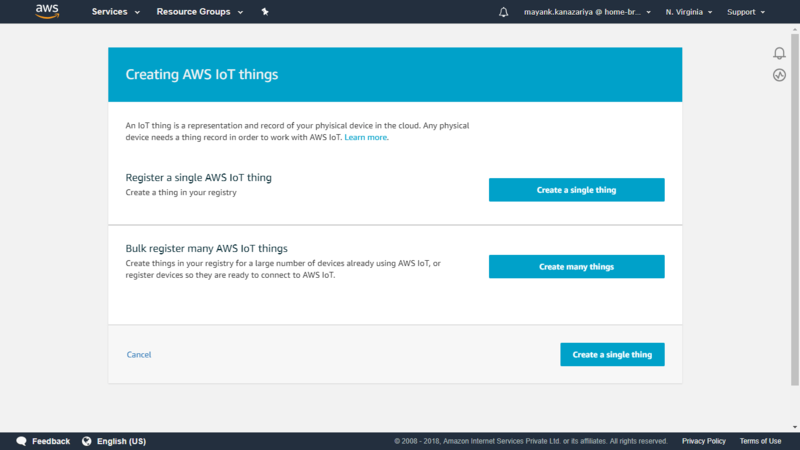 To get started with AWS IoT, you need an AWS account. If you don’t have an AWS account, you can create one here. 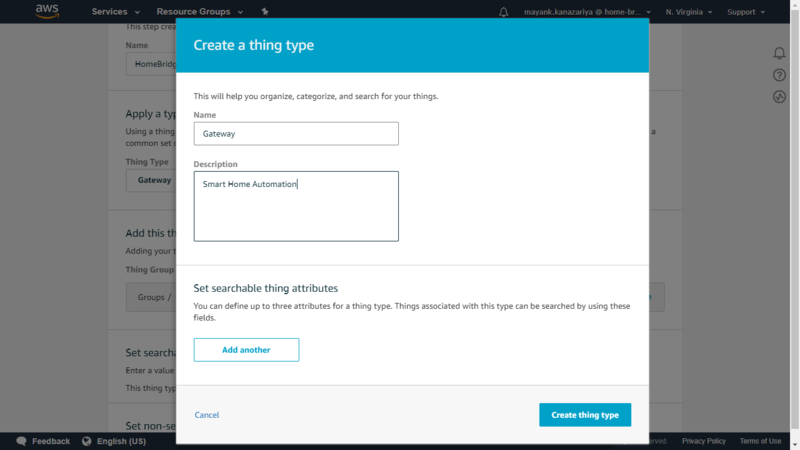 Once you have created your account, you can log in and navigate to the AWS IoT Console. Now that we have our Thing set up in AWS IoT, we are going to complete the remaining operation from Mobile Application to send data. 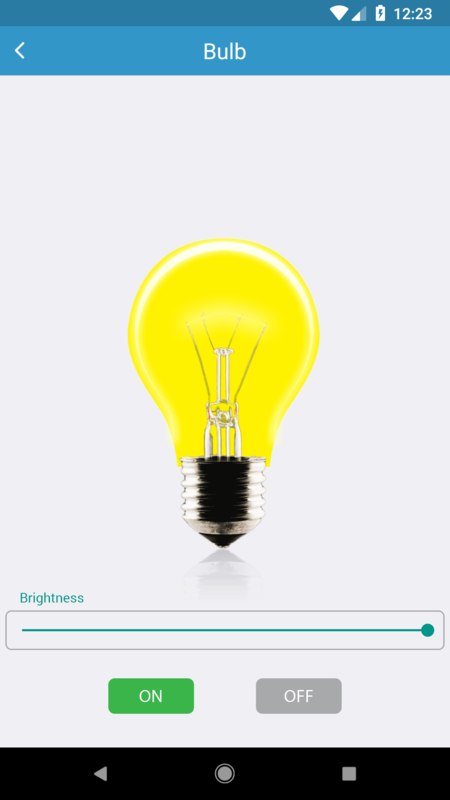 The Basic steps for monitoring status and the controlling light bulb is shown in the getting started guide and video tutorial. The above demo used the MQTT approach to fetch the shadow data. With this, we are done with the setup of a Thing. 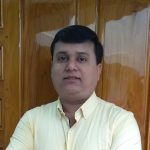 Mayank is associated with VOLANSYS Technologies as a Sr. Engineer. He has served in multiple industry verticals and worked upon many tools and technologies till now in his journey. Being passionate, he always looks forward to the opportunities to bring both performance and cost optimized solutions.